I love the brand Summer Infant. Over the past couple years I’ve had a chance to get to know and meet the brand and having a baby has really let me learn the product. Some companies are great just because their products are great but I believe Summer Infant is great because the people behind the products are even better. So, when I found out they had come out with the Prodigy™ Travel System I knew I wanted to try it. 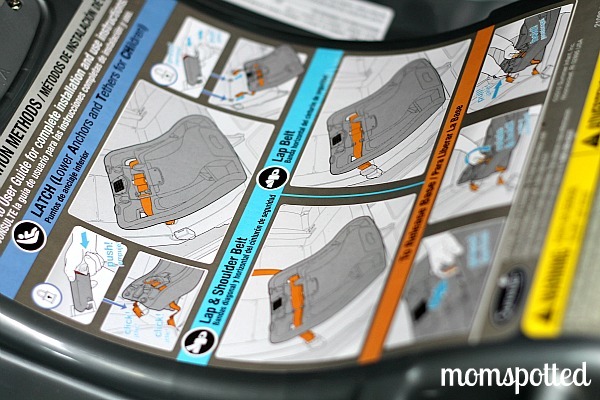 It didn’t bother me that they had never designed a car seat in the past I knew the people behind the company wouldn’t just make a safe car seat but a safe, great car seat. And they did. 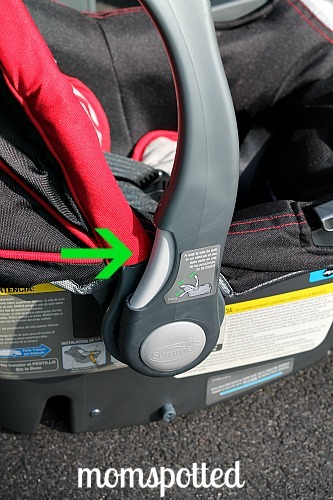 The Prodigy Infant Car Seat received the highest score possible — a 5-star Ease of Use Rating – from the National Highway Traffic Safety Administration (NHTSA) in every category: Evaluation of Labels, Evaluation of Instructions, Securing the Child, and Installation Features. 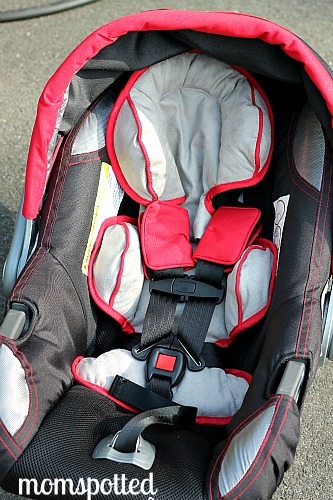 NHTSA believes the best car seat is one that fits a child properly, is easy to use, and fits your vehicle correctly. Each car seat tested goes through a stringent set of assessments, and a 5-star Ease of Use rating best fits NHTSA valued criteria. Summer Infant’s Prodigy Infant Car Seat earned this top score from the administration’s testers. Let’s talk about the stroller first. From a far it looks like an ordinary stroller but it isn’t. 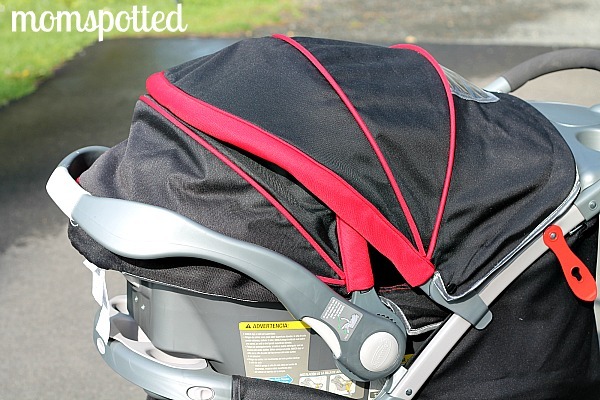 Sure it has a soft cushioned place for baby to sit with a five point harness and cushioned covers but it has many other features too. First I Like that it has a snack tray. What I LOVE is that it’s removable for easy washing!!! It even has separate spots to keep things in their place. We get a tray too! I love that there is even a covered area so I can stick things I don’t want everyone seeing like a debit card or my keys. The seat reclines and is a simple one handed task. Squeeze the top and bottom metal bars together and either pull up or push down. The basket isn’t huge but it’s pretty good size and even with the seat fully reclined like in the photo below you still have a great angle to get in and out. The wheels are nice and sturdy. 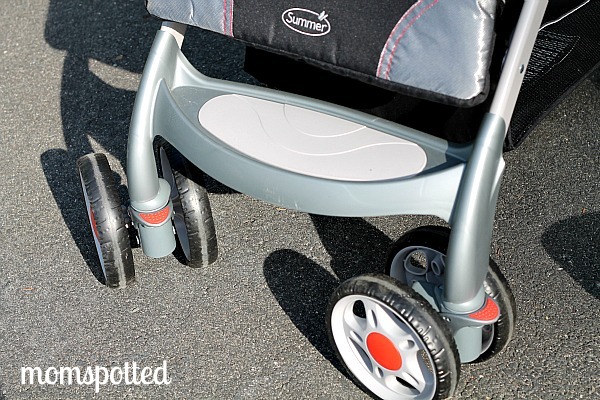 The stroller runs smoothly over smooth surfaces but I love that it feels sturdy over rough surfaces. 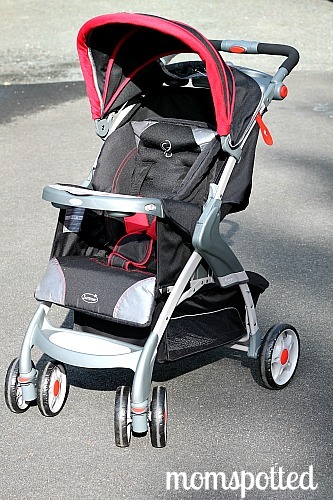 I like to know when I go outside and go off the trail my stroller can handle it and this stroller feels like it can. Everything is one handed and simple. 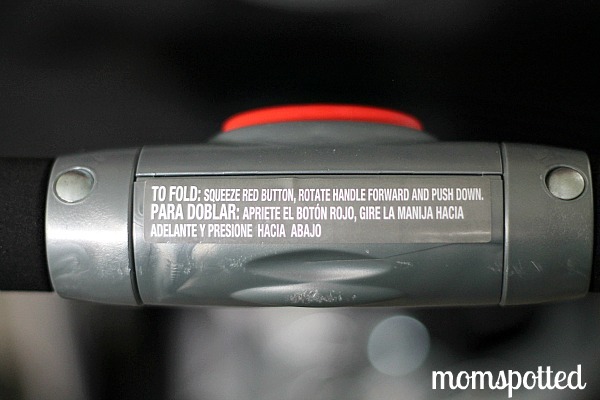 The bottom arrow allows you to adjust the handle height. This is great because nothing bothers my husband more then bending down to push a stroller. 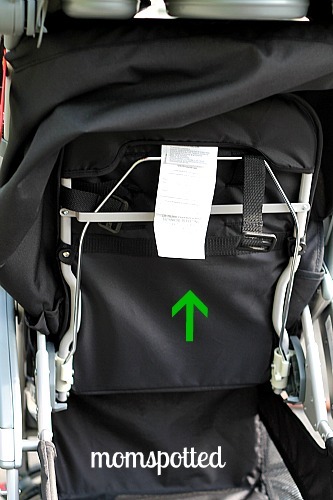 That top arrow is the one handed way to fold the stroller down. Simply grab the handle, push the button, and twist it out. When it twists push down and it folds! 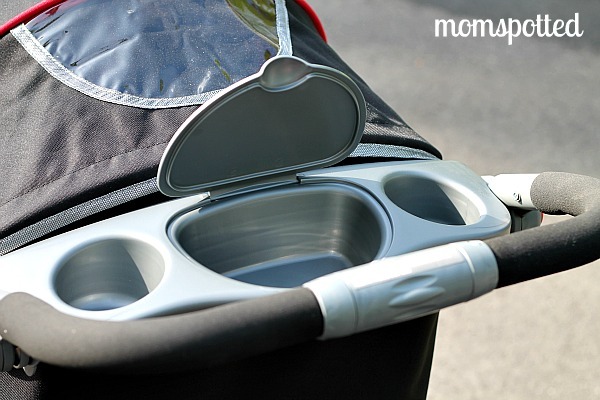 The stroller was bulky when folded. It does stand but no matter how much I tried I could get it to close all the way to lock it. I got it super close though. It will stand when folded. 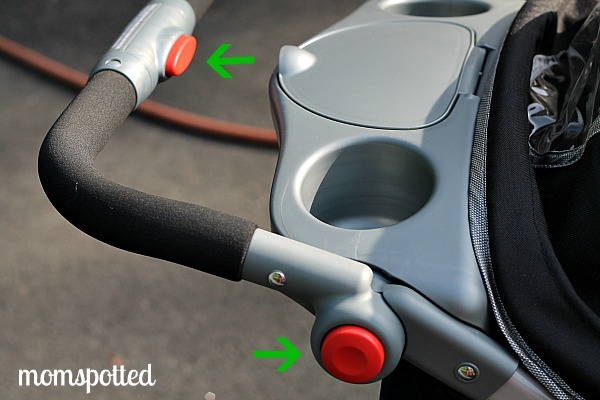 When you add in the infant car seat it sits on the stroller nicely. The seat must be reclined in order to place the seat in. I love how both adjustable canopies can completely cover baby for protection and privacy! The handle is so easy to adjust. Just push the side buttons and it moves. It comes with a basic infant insert already in place but also comes with an additional infant insert. I love that it included all the cushions and straps cushions so you know they are all meant to work with the car seat and nothing that might mess with it’s safety features needs to be added. Here you can see it installed in the back of my van. 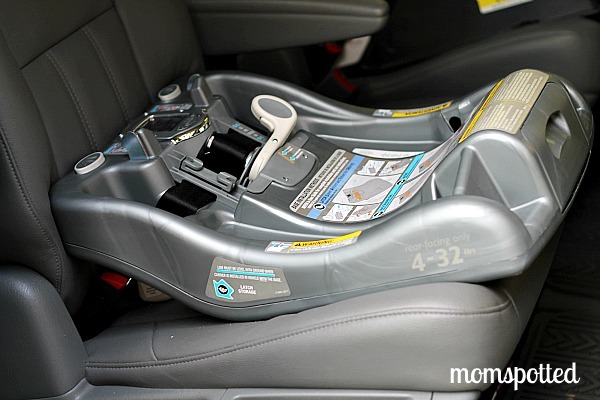 This base is amazing and made my husband turn and say its the best car seat I’ve ever reviewed. For your first installation or when someone borrows the seat you know it will always be installed properly because the seat has the instruction right on it! 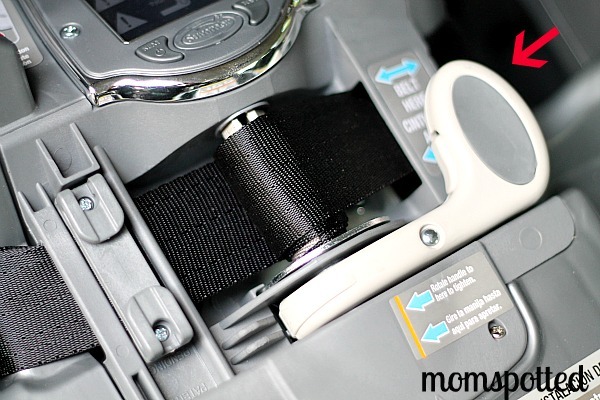 First you’ll want to see if your seat has these harness devices installed. I think all vehicles made after 2002 required them. Need you’re going to thread the latch through the seat and attach to the harness. 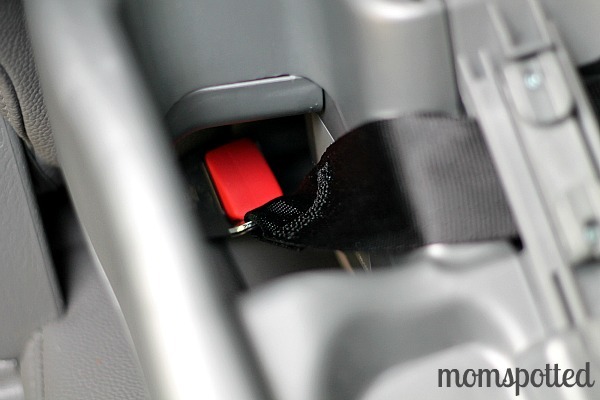 This will prevent the base from flying from the car in an accident. There are two latches, one on each side. My husbands favorite part is this base’s unique belt tightening system. By just moving the lever back and forth it tightens the belt to the proper tightness without having to struggle or fight with it. It’s amazing. I’m all smiles 🙂 How simple was that? It requires 3 AA batteries that come with it. This travel system is amazing. I was really happy with the system I was using previously for (cough) 3x the price but we are now using this one as the safety features really can’t be beat. 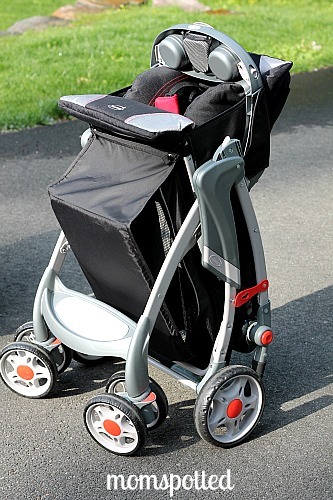 If you are considering this travel system it’s amazing. You can go down to your local Babies R Us and check out a built model. 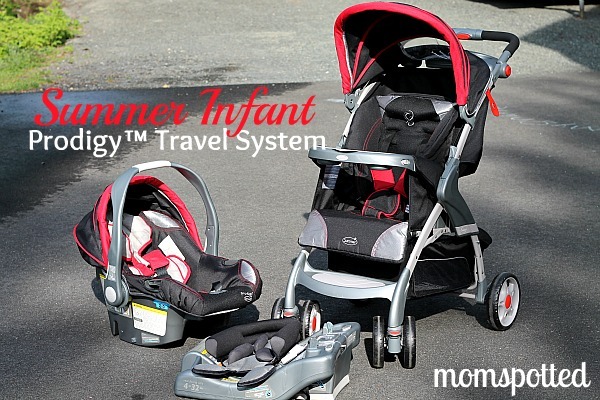 You can purchase the Summer Infant Prodigy™ Travel System from Babies R Us. I love the video monitors! i love their story time potty! potty training is becoming a nightmare in our house. I’ve liked your fan page and left a comment under the blog post listing there! GFC follower as Addison K.A.T. I would love the Snuzzler Bouncer. I follow Summer Infant on twitter @ssgwkramer. I follow you on twitter @ssgwkramer and tweeted. I like the monitoring systems! I LOVE the BabyTouch™ Digital Video Monitor. Best video camera we have had so far! Follow Summer Infant on Twitter @barkersmomma. Fan of Summer Infant on Facebook. I would really like the BabyTouch™ Digital Video Monitor. Could come in handy! That would be what I would pick from their site of goodies! I love the gentle vibrations massaging toothbrush! I like the by your side sleeper. 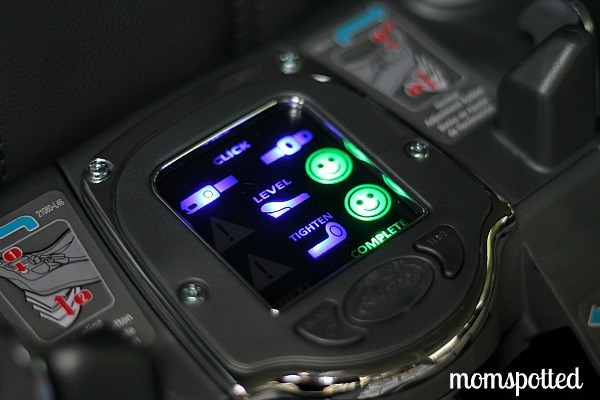 From Summer Infant, I really like their Best View Handheld Color Video Monitor. I am a fan of Summer Infant on Twitter. I like the Storytime potty. The SuperSeat looks like so much fun! We have their infant color monitors for both my kids rooms. I love them! It is a must have item in my list! They are the best! I love the video monitors by Summer Infant! I love the the summer infant baby touch digital video monitor. Like MomSpotted on FB and left a comment! Fan of Summer Infant on FB! And left them a comment! Follow summer infant on twitter. This is super nice! I also love the Animal Parade the classic wood bassinet from Carter’s. I like their video monitor that I have. I subscribe to the email blog. Ops! I made a mistake and sent it here on this giveaway. I don’t know how to delete it. I thought I was typing at the same comment box. Sorry! 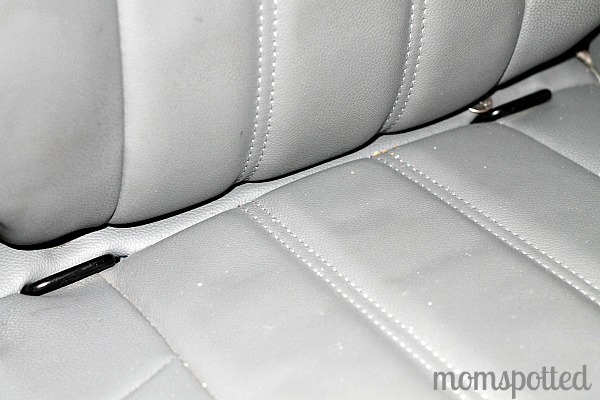 Oh man, I need a new carseat for this baby on the way! I love the Carter’s® Bumble Soothing Playard & Portable Changer too! i like the super seat! I also like the Summer Infant Baby Touch Digital Video Monitor. I really really love this high wooden and metal gate from Summer Infant! We bought one but need two more for the babies! thanks much! I posted about this giveaway on my facebook page! I like the Story Time Potty. I follow Summer Infant on Twitter on kdavis52. I am a fan of Mom Spotted on Facebook as Kathy Newsom Davis. I like the Ultimate Comfort Body Pillow. Love the Fold Away Baby Bath. I would love to have the Carter’s® Wild Life Classic Comfort Wood Bassinet! I’d also like the Story Time Potty from SummerInfant. Your Welcome Home Sawyer button is on my blog at http://theclothexperiment.blogspot.com/. Your Mom Spotted button is on my blog at http://theclothexperiment.blogspot.com/. I am a fan of Mom Spotted on FB. I am a fan of Summer Infant on FB. I like the baby touch digital video monitor. I have been subscribed to ur blog via email.. I like the digital video monitor. I’m following you on Twitter @carissads1 and I tweeted. 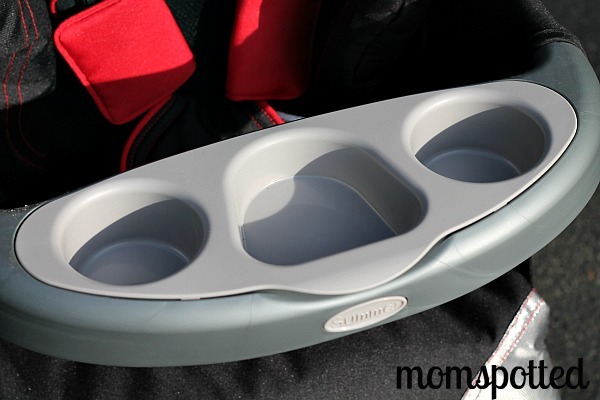 I like your fan page on FB – Cari S.
I like Summer Infant on FB – Cari S.
I love the disney cars deluxe lil racer booster seat! Since I’m potty training my daughter now I am very interested in the Story Time Potty! I just Liked your page on Facebook and left a comment. I commented on your https://momspotted.com/2012/05/two-months-old-sawyer-james.html/comment-page-1#comment-229593 post! I like the Carter’s Bumble Cozy musical swing. Liked Mom Spotted on Facebook & left comment (Alisha Hodges). I absolutely love the SwaddleMe product. There is nothing better for swaddling your baby safely and comfortably. Following you on Twitter and daily Tweet. i love their frog potty seat! I love the rocket ship feeding chair. My aunt has it at her house for the babies and they love it. 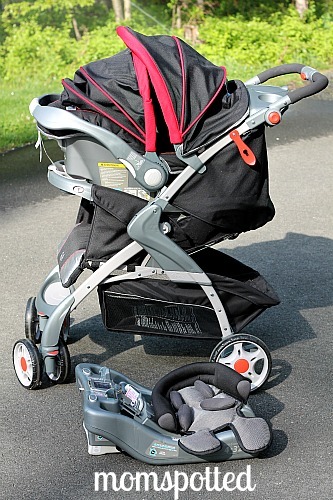 I love the Prodigy travel system in Mademoiselle Fashion! Fan of Summer Infant on Facebook! I also like the Story Time Potty. I follow you on GFC as Jan Messali. I follow Summer Infant on Twitter as janj4c. Another product I like is the SwaddleMe Organic Cotton. 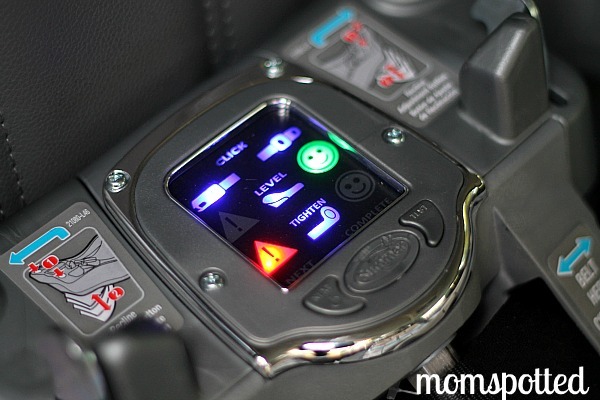 I love the summer infant prodigy car seat – The Tavel system is by far my favorite product!! The Carter’s® Wild Life Cozy Comfort Musical Swing is super cute too! i also love the story time potty! i like their story time potty – too cute! I like the Carter’s Wild Life Cuddle Me Musical Bouncer. I like the Swaddle Me Sack Muslin in the Busy Bees and Toss pattern. oops.. wrong link on that last one (927).. too tired tonight, I guess. So sorry! !